They call it “swine flu,” but it is the exact same virus as the “Spanish flu,” the influenza A virus strain of subtype H1N1, or A/H1N1, which killed 50 million. This is the exact same virus which caused the influenza epidemic that swept the world in 1918 killed an estimated 50 million people. One fifth of the world’s population was attacked by this deadly virus. Within months, it had killed more people than any other illness in recorded history. Some victims died within hours of their first symptoms. Others succumbed after a few days; their lungs filled with fluid and they suffocated to death. The term “swine flu” is being used to avoid panic among the public. This may not be a good idea, as an informed populace will have a better chance of survival. The Associated Press has been spreading the false propaganda that the current outbreak is the H1N1 virus, which is a dangerous lie. The US Center for Disease control confirms that we are being attacked by the A/H1V1 virus, which was the same virus as in the 1918 Pandemic (Wikipedia). The world population in 1918 was about 1.8 billion. Today it is about 6.5 billion. In 1918 3.6% of the world’s population died from Spanish flu. 3.6% of today’s global population is 234 million. Mexico has only about 1 million anti-viral doses for its 90 million people. The U.S. has refused to state its capacity to treat the pandemic. Mexico is questioning the origin of the viral outbreak, which occurred immediately after U.S. President Obama’s visit to that country. 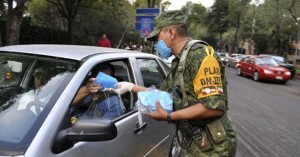 Was the virus unleashed to kill off the Mexican drug traders? In any event, now that the deadly virus is “out of the bottle” its deadly wind is spreading around the world like a cyclone. We are in the Great Pandemic of 2009. We are in the Great Pandemic of 2009……………. You guys are too much, if it ends up to be true (which I doubt) so be it but to try to send the public into a terror is just plain wrong. You fools will do anything for a headline…hope you get the flu you are wishing onto the world. 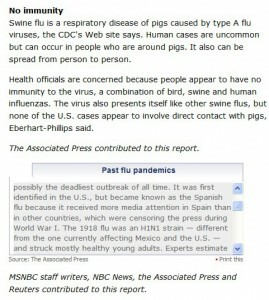 It is little mentioned in the news, but swine flu is again on the march. Google and you may find some articles. We just had the worst immagineable flu ever – every symptom you can imagine. Of course, our doctor “ruled out” swine flu, but gave us everything from penicillin shots to antibiotics to anti-viral medicine. Of course we are keeping this a secret, as we still want our friends to invite us over. Just look at the TV – it is all they are talking about. The U.S. has only 12 million doses of the antiviral Tamiflu for a population of 300+ million. Mexico has NONE – they don’t even know what Tamiflu is. Our health Czar, Sebelius, has not been confirmed by the U.S. Senate as she is a tax cheat. Her department is not staffed. The position of Surgeon General which was supposed to go to a newsman is unfilled, as he turned the job down. Meanwhile, blase’ Americans, like yourself, simply float through life, oblivious to what is happening with the Swine flu, and by Obama’s givaway of your money to the bankers. By the tone of your remark, one might suspect that you are in the employ of the U.S. government – the last refuge of scoundrels. 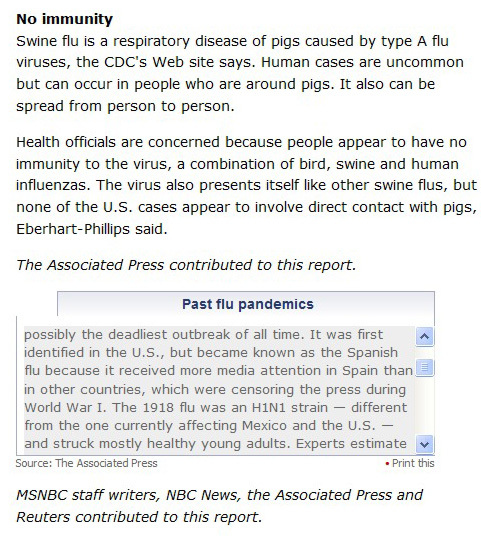 New Flash: The CDC has just raised the Swine flu threat level to 4! …I don’t know what to say. Since you quoted from Wikipedia, you should have checked your facts more thoroughly in Wikipedia itself – there are MANY DIFFERENT STRAINS of the A(H1N1) virus. The link you provided to the webpage of the US Center for Disease control also has NO mention of the “H1V1” virus. Where in the world did you get that from?! Since you email us anonymously, I might suspect SPAM. However, you failed to notice the difference between the “Associated press lie” graphic, and the CDC link. No one said there were not other strains of the A(H1N1) virus. Hope this helps you in getting at the truth. Ah, I see what you mean. Yes, I failed to notice that the AP article was wrong about the fact that this Swine flu is different from the Spanish flu. I’m not sure if that was an honest mistake, but I suppose that is open to speculation. However, you said: “The US Center for Disease control confirms that we are being attacked by the A/H1V1 virus, which was the same virus as in the 1918 Pandemic (Wikipedia).” But the US Center for Disease webpage that you linked to did not mention any A/H1V1 virus. You also said: “This is the exact same virus which caused the influenza epidemic that swept the world in 1918 killed an estimated 50 million people.” Yes, you did not specifically say that there are no other strains of the A(H1N1) virus, but the impression given by the words “exact same virus” then becomes misleading – if you knew that it was a different strain. I am as interested in the truth as you are, which is why I am meticulous in checking out details and emphasise fact-checking. I don’t trust the mainstream press, but I get disappointed when I search alternative media and find that they are not reliable. Finally, I don’t think a spammer writes long, thoughtful responses to posts. I would prefer to remain anonymous for many reasons, but that does not mean that I am not serious about what I write. Very cogent comments. I appreciate your respect for the truth and fact checking. Thank you. I agree that instead of “exact same virus,” “exact same strain” would have been better. Obviously, you are not a spammer, but you do have an interesting email address. Anytime you wish to contribute, or perhaps even post an article, let me know. My brother got infected with H1N1 or Swine Flu in Mexico. He got a mild fever and luckily he did not die. That H1N1 is no fun. I hope no one gets it.